The Association of Independent Funeral Homes of Virginia is the only professional state organization dedicated solely to the interests of Virginia’s independents. IFHV is please to offer a number of member benefits which we hope you will fully utilize. If there is any way we may help you obtain more from your membership please just let us know. 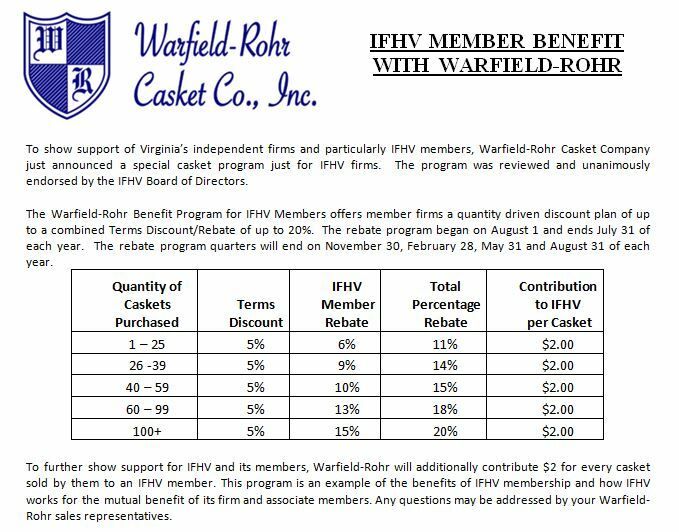 Discounts on all IFHV sponsored CE Events; including the Annual Conference, One Day CE Seminar, and the Cremation Certification Course. An Annual Directory; including updates to Virginia’s laws and regulations affecting funeral service licensees. Quarterly Newsletters which provide relevant and timely updates to the funeral service professional. IFHV offers a free and no obligation review of member firm’s group health insurance plans. Often IFHV endorsed group health insurance plans can provide savings to our member firms. IFHV members, their employees and families are eligible for special preferred rates on Long Term Care Insurance. IFHV members are eligible for special preferred rates on Income Disability Insurance. We monitor regulatory activities of the Virginia Board of Funeral Directors and Embalmer to ensure that the business and professional interests of independents are considered. IFHV is widely recognized as a successful and influential voice in legislative issues considered by the Virginia General Assembly. Many of IFHV’s legislative initiatives serve as a model for other states. Listing on the IFHV website under the “Find a Funeral Home” search feature.